Applications: The Finit-Easy tool allows access to difficult to reach areas. 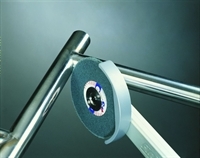 The SA+ wheels make finishing easy, quick and consistent. Below under 'More Information' we have detailed some of the main uses for each of the SA+ wheels on the Finit-Easy machine. The wire brush wheel has a narrow 6mm face making it suitable for pipeline weld brushing. It will also apply aggressive cleaning action to corner welds and stubborn coatings. Product Notes: Click the 'More Information' tab for further guidance on grade selection. In summary, grades 1-3 leave fine finishes. Grades 5-10 remove material, with grade 10 being most aggressive and grade 5 giving the better finish. Due to strength issues the narrowest width, 3mm, is only available in grade SA 7 upwards. The wire brush wheel is stainless steel grade AIS1302. Also Available: The Finiteasy machine offers huge advantages in finishing internal welds. We also offer unitised finishing SAG discs which can be used on the Finiteasy and other machines for use on larger areas. SA 1, 2 + 3: Available 6mm wide and wider. Great for de-burring and removing blueing. Grade 1 leaves a very fine satin finish. Grade 2 is particularly effective for leaving a fine satin finish on alumium. Grade 3 is softer than grade 1&2 and gives a more consistent finish on harder alloys. SA 5: Available 6mm wide and wider. Use for blueing removal, blending and light scratch removal. SA 5 leaves a light semi-polished finish on stainless steel. SA 6: Available 6mm wide and wider. Similar finish to the SA 5, with increased cut. Use for blueing removal and weld blending of aluminium. SA 7: Available 3mm wide and wider. Most popular disc for blending and radiussing of stainless steel tig welds. MA 8: Available 3mm wide and wider. Increased aggession on the SA 7. Typically used on larger weld build for material removal with a good finish. TA 10: Available 4.5mm wide and wider. The most aggressive wheel. For more rapid stock removal, although less fine fnish.